There is substantial evidence to suggest that crooked teeth are the result of poor facial growth and that modern lifestyle choices are playing a major part in preventing the good facial development needed to have room for a full set of adult teeth. The realisation of what this means is revolutionary. Crooked teeth are preventable! Education has the power to transform our children’s lives. If we can prevent crooked teeth from occurring, we can minimise their associated health problems and reduce the burden on the NHS. For a healthier and happier society, please support our campaign. We need your help to bring about this health revolution. Our campaign aims to make good facial growth a strategic health priority in two ways. Secondly, through getting Public Health England to make research, analysis and treatment policy in this area part of their next strategic plan. If we can achieve this, we believe that it will be possible to significantly reduce the number of people requiring intervention for crooked teeth, sleep apnoea, Temporomandibular Joint Dysfunction and many other associated health conditions. Please support our campaign by signing the parliamentary petition and following us on facebook. an almost complete change in diet has hugely reduced the work that our chewing muscles are required to do. epidemic levels of allergies are leading to frequent blocked noses. If you cannot breathe through your nose you have to open your mouth and lower the tongue which is supporting the top jaw. This impacts on facial growth. Children are not breastfeeding for nearly as long, which interferes with the normal function of the tongue and lips. Children are being weaned onto soft food instead of foods that require them to chew, which is disrupting a move from an infantile suckle to an adult swallow. 1 and 2 are the most important for the shape of the face, while 2 and 3 are the most important for the position of the teeth. If you have weak muscles and you hang your mouth open, then the face drops down. See anyone who has a stroke, although this only affects one side of the face. The changes can be seen clearly in school children. In those who mouth-breathe, the face lengthens (or downswings), the cross-sectional area reduces, leaving insufficient room for the larger adult teeth. The leads to crowded, crooked teeth and affecting the airway. Good medicine is about identifying the causes of the problem and preventing them, not merely alleviating the symptoms and possibly worsening the underlying problem in doing so. We would like to see a move to an evidence-based approach to the treatment of crooked teeth that is focused on prevention and on understanding the implications for the whole face and respiratory system. How can we be right, and an entire profession be wrong? There are actually a lot of highly regarded professionals quietly agreeing that facial growth is important for preventing crooked teeth and other health problems (see our supporters page). However, facial growth is not yet a mainstream consideration and treatment continues to focus on dealing with the symptoms once there is a problem, rather than with prevention. Why do related people look the same and have the same types of crooked teeth? Put people with the same genetics in the same environment and they are likely to have the same problems. The way that we are living is so normal to us that we don’t notice the impact this has on our health and facial growth; we only see the genetic influence, but genes only provide a predisposition. They do not cause crooked teeth. It is almost normal for fixed braces to damage the roots of the teeth. Some are not much affected but many lose half their length. The real problems come when people are 40 or 50. If they get gum disease or if the tooth needs a root filling, the loss of root becomes problematic and the teeth are far more likely to be lost early. There is often some gum damage during treatment, but young children usually recover. However wearing retainers effectively holds the teeth out of their natural balance zone and in time the gums will want to move back leaving the teeth without full support, which will result in premature loss. Can faces be damaged by orthodontic therapy? In the late 90’s Prof John Mew was interviewed on Dispatches where he made the statement that in his opinion 20% of the children who undergo orthodontic treatment have noticeable facial damage. This is due to retractive approaches such as traditional headgear, extractions and fixed braces themselves, leading to a downswing in facial form. 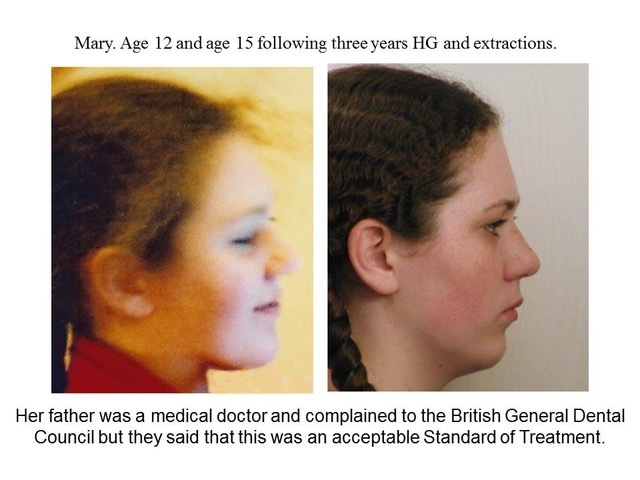 This is a good examples of what we mean; Mary was given traditional orthodontic treatment at the age of 13. This involved the extraction of 4 teeth and the use of fixed braces with elastics (known colloquially as train tracks). Profile photographs of her taken before and after treatment clearly show the damage done to her lower face, including the loss of chin, the change in the angle of the lower jaw and a more pronounced misalignment between the upper and lower lip. The treatment also narrowed her airways, making her more prone to nasal congestion. How often are faces damaged by orthodontic therapy? It is difficult to say. There was a very strong reaction to the Dispatches program and much research done to demonstrate that this does not occur. Unfortunately, there was some misunderstanding, the profession continued to exclude Professor Mew from any engagement and the research did not really address the issues he raised. We feel that Professor Mew was approximately correct and we worry that the prevalence of malocclusion, including severe cases, may be increasing. Can orthodontics lead to sleep apnoea? 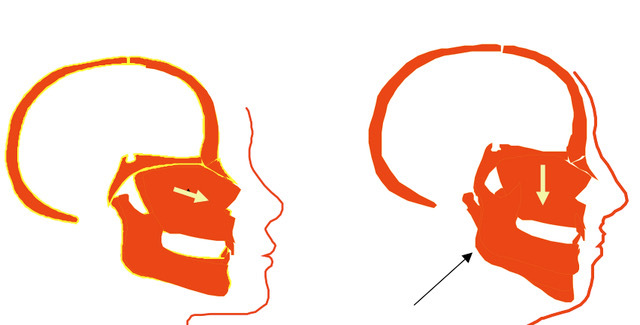 If a face downswings, the tongue moves towards the airway. One of the most important measurements in predicting sleep apnoea is the distance from the back of the throat to the point just behind the chin where the tongue is attached. In almost every study in which there were controls of untreated patients, orthodontic therapy lengthened the face, effectively causing a downswing in facial form, bring the tongue closer to the airway. The effect is noticeable on the face in about 20% of the cases. It is very interesting that tongue exercise have been shown to help correct sleep apnoea. Is mild sleep apnoea related to ADHD? Prof Stephen Sheldon of Chicago believes that ADHD is caused by mild sleep apnoea, which may often be difficult to diagnose. Interestingly the rapid increase in ADHD seems to parallel the increase in crooked teeth and is treated with amphetamines designed to help people stay awake. Observing children who are very tired they can often be very disruptive in a very similar manner to those with ADHD. Are other professionals also worried? What can I do to help my child grow up without needing orthodontic therapy? There are some simple things that can help reduce the likelihood of your child needing orthodontic therapy. These work by encouraging the jaw to grow well. Eating a chewy diet and chewing food well helps. Also, breathing through the nose, with the lips closed and the tongue resting on the roof of the mouth is important. Can orthodontics lead to temporomandibular joint dysfunction? Temporomandibular joint dysfunction is caused by there being a discrepancy between the degree of joint opening where someone rests and where their teeth bite together. In general, joints arrange themselves so that they are balanced and functional in the position of rest, where they are most of the time. If there is a significant difference between the resting and loading positions, and large loads are regularly exerted through the joint, from issues such as clenching or bruxing, then the joint can be damaged. The problem is that many people lack tongue space, so rest some of the bulk of their tongue between their teeth, in preference to it encroaching their airway. If orthodontic therapy reduces tongue space and an individual responds with a tongue-between-teeth resting posture, then it is quite possible that the therapy will have been responsible to the problem. How do I improve my respiratory system now I am an adult and my bones have stopped growing? If someone in their 80’s had a stroke affecting one side of the face that side would downswing. So, it is clearly possible to change at any age, long after growth is complete. The problem is that it is difficult. We are creatures of habit, and not only is it difficult to change our neural pathways, but, in this situation, our habits and posture dictate our structure. Often the best way to change is to gain a little more tongue space and use that as a catalyst to gain further change. However, it should be borne in mind that if it were possible to hard wire into someone postural and functional pre-sets then this is all that would be necessary. Retractive or Non-Retractive Orthodontics - what's the difference? Retractive orthodontics: While aligning the teeth and balancing the relative position of the jaws, retractive orthodontics often pulls the face back and down. This is often associated with pushing the upper teeth further back to reduce an overbite, retractive headgear and extractions. When fixed braces prevent the back molars from fitting comfortably together there may also be a retractive effect. Non-Retractive Orthodontics aims to avoid any retraction. Treatment methods often involve expansion of the jaws to accommodate a full set of adult teeth, protraction headgear, and non-extraction treatments (except distalisation). These methods are often used in combination with training such as Myofunctional therapy. It is often easier to retract the jaws to gain a balance and good alignment, and it is sometimes difficult to prevent any retraction, depending on the patient’s own oral posture.